The electrical cable termination is the physical and electrical connection of a cable end that connects to another cable, or to the terminal of the equipment. The cable terminations are often designed to enable the physical and electrical interconnecting of two cable ends, or a cable end and a terminal on the equipment. The electrical connection requirements relate to the voltage drop, current carrying capacity, compatibility of the materials, etc. The physical requirements relate to the environmental protection as well mechanical security. Type of Connector on the equipment where the cable will be connected. The cable joints are used to connect low, medium or high voltage cables. The type of cable joint sizes, shapes and configurations vary according to the voltage, structure, insulation and the number of cores of the cable to be jointed. The joints provide electrical insulation as well as mechanical protection and strength. The electrical connection is made in various ways and can crimping, or use of mechanical connectors, soldering, etc. The joints are designed for low, medium or high voltages and it is important to match the capacity of the joint to that of the cable otherwise a low power cable joint will fail if subjected to high current. The cable joints are made according to how the cables are to be connected. 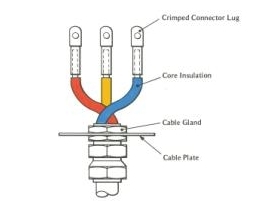 The simple joints such as the straight through connectors are used to connect two power cables at one point while the other more advanced branch connectors may be used to accommodate a cable branching off the main line or several cables coming into one joint to form one main cable. The cable joints are required to have the same number of cores to those of the cables to be joined. There are different cable insulations depending on the application of the cable and the cable joint must be compatible with the cable insulation. To maintain insulation of the jointed cables, there are a variety of insulation procedures, and can be either heat or cold shrinkable insulation, r molded type of insulation, or use of tape. There are about four commonly used types of joints; these differ in mechanical arrangement and where they are used. However, some manufacturers may provide custom designs to suit unique customer requirements. Straight joints can be used for indoor, outdoor, submerged and underground cable jointing. In the cast resin based cable joints, the polyurethane based casting resins provide mechanical protection, electrical insulation and moisture imperviousness to the joint. A typical Y type branch joint is as shown in figure 3 below. This is used to join low voltage, polymeric, non-shielded cables of between 1 and 5 cores. The branch jointing provides a reliable electrical connection, electrical insulation and mechanical protection. The connectors are either the compression or the mechanical type. The branch joints can be used for indoor, outdoor, submerged and underground cable jointing. 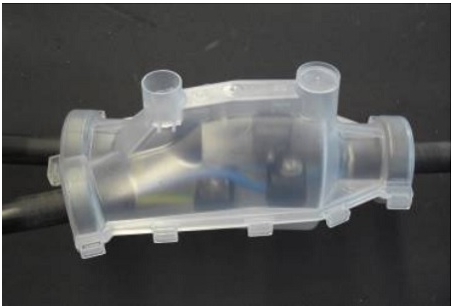 The design has a mold body construction with seals and fixing clips. This makes it easy to do the jointing while the sealing eliminates the need to tape the joint. The pot end joints are used at the live voltage cable ends. In a typical cable, each of the cores is sealed separately using a heat shrink cable end caps. A screen bandage is then applied to provide for earth fault protection and the combination is then covered with a thick wall of heat shrink cable cap. The pot ends joints are suitable for temporary and permanent cable abandonment to provide safe termination of live power cables for indoor, outdoor as well as underground cables. The cable joints and terminations provide a means of making reliable electrical connections between different cables or between the electrical cable and the terminals of equipment. There are several standard type of cable joints and terminations, however, manufactures can make tailor made joints to suit different technical requirements. The requirement for joints and terminations is that they should meet the standards in terms of electrical and mechanical properties, insulation, earth continuity, environmental protection and more. Did this article help you? Let’s discuss below!